About 2 years ago the idea was born together with our companions of Art of Foto in St. Petersburg and now we present a world premiere. After more than four decades without any innovation in the range of horizontal enlargers, we are introducing the world's first enlarger for negative sizes up to 20x24 inches. After the legendary Focomat series build by Leitz has been stopped – is there now again an enlarger made in Wetzlar? Yes! It was important to us not just to work out a new variant of existing designs. Our aim is to combine current technology and customer requirements in a novel concept. As expected, the implementation took place in solid metal construction. The up to 20mm thick aluminum plates give the device the look that the user may expect. Three individual adjustable lifting columns, the steering and the drive give the device all six degrees of freedom of movement. As a result, it is possible to dispense with the laying of a rail system in the darkroom. Gone are the days when the user stumbles over these rails. Moving the 450kg device is very easy by radio remote control with joysticks and 6 motors. A setting range of 100 to 1300mm allows the use of lenses in the focal length range of 150 to 1000mm. The guiding system complies with high-quality engineering standards, ensuring long-term stable parallelism between the negative and objective levels. 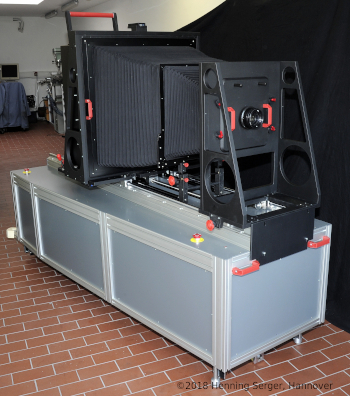 Three lasers measure the distance to the projection screen with millimeter precision, thus allowing a precise alignment of the negative plane with the projection plane. At the push of a button, the device starts to move and aligns automatically by the integrated automatic and end up in an equal distance of +/- 1mm to the projection wall. Of course, we used our proven LED panels as a light source. More than 15.000 LEDs generate sufficient light for each magnification scale. Is this too bright? No problem, because the integrated dimmer allows to adjust the exposure times in the range of 5 f-stops. The LED head needs fans, but these are switched off during the exposure phases. This is a mile stone for the future of classic B&W photography!